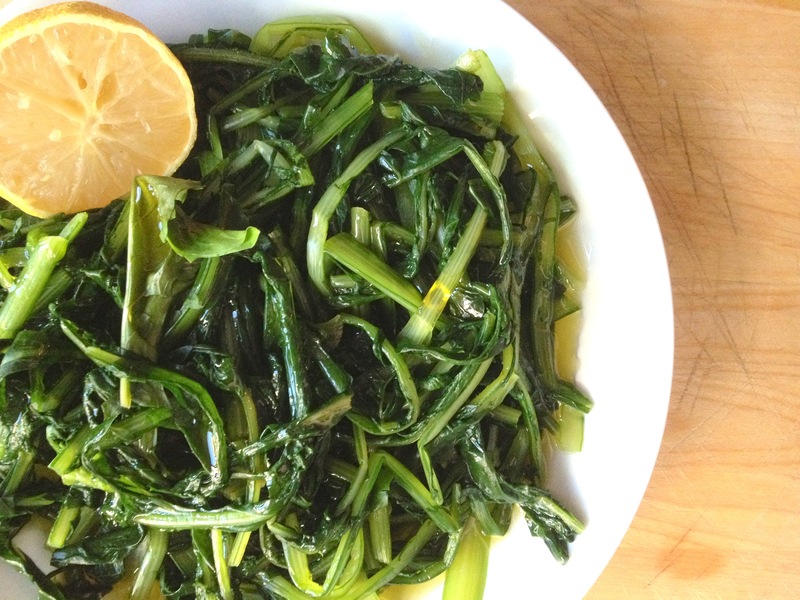 Horta is a catch-all term for greens and horta vrasta means simply boiled greens. This recipe features dandelion greens (radikia in Greek) which are certainly very popular in Greek cooking as are their other green friends vleeta (amaranth), mustard greens and chicory. A dish of boiled greens drizzled with olive oil and a squeeze of fresh lemon juice is quite probably one of the most satisfying and really delightful meals you will every enjoy. Many of us have stories of Yiayia or Papouli going into the yard (or stopping by the side of the road!) with a kitchen knife, digging delicious dandelion weeds from the ground. Packed with nutrients, wild greens have helped to sustain people through many times of scarcity and hunger and have a special place in Greek food culture. They couldn’t be easier to cook up so put on a pot tonight! Here in the Northeast US, we can buy them at the grocery almost all year round. Granted, they’re not as fresh as picked right from the earth but really a very good second place and well worth adding to your market list! I like to look for dandelion greens that are still have the stalks attached to the root end. They’re tastier and more tender than their loose-end counterparts so take a minute to check what’s available at your store. Cut stalks off about an inch above the root end and chop your stalks into manageable pieces. I chop an approximately 18inch stalk into 3 pieces. Easy to eat, no knife necessary! A way to make the cooking process even easier – put your pot of salted water on to boil before you begin to chop/wash your dandelion greens. That way you can toss them right in when you’re done – no waiting! To clean, just drop your chopped dandelions into a big bowl of cold water and swish them around to rinse away any dirt or sand. Turn out the bowl into a strainer over the sink and pop them into your boiling pot. Gently push them under the water and stir. Bring them back up to a boil and cook for just 10 minutes. I say 10 minutes for store-bought greens. For just-picked greens, 4-5 minutes will be plenty as they’re fresh and tender, no need to over-boil them! Either kind, they’ll wilt right down so feel free to pack a whole lot into your pot. To test for doneness, scoop up on of the stalk pieces as they’re the most fibrous and see if its floppy when hanging of your spoon. If yes, follow up by tasting – you want them to be soft and easy to chew but not mushy. Once they’re done – do not strain off the water! I often cut the dandelion tea with a bit of mint tea to make it a little more palatable. Its not awful to drink as some medicinal teas can be but a splash of mint doesn’t hurt! You can also freeze the dandelion tea in ice cube trays to have on hand later should you need them. Dress your warm dandelion greens with copious amounts of excellent quality Greek olive oil – save your best stuff for dishes like this! – and a good squeeze of fresh lemon juice. Pair with a hunk of crusty bread and a more delectable, delicious, downright wonderful meal you’ll be hard pressed to find. In a large pot, bring salted water to a boil. 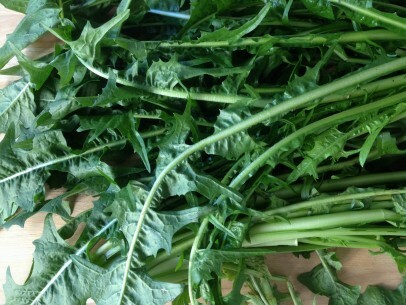 While waiting for water to boil, chop and clean dandelion greens. Cut stalks off approximately an inch or so above the root end and chop greens into manageable sized pieces. Submerge chopped greens in bowl of cold water and swish to get rid of any dirt or sand. Drain off and add to pot of boiling water. 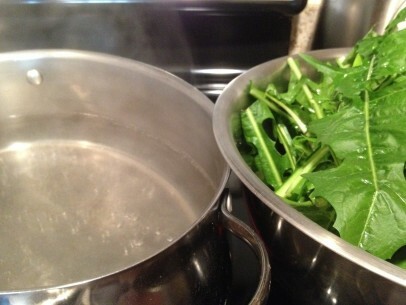 Bring water back up to a rolling boil and cook for 10 minutes until dandelion greens are soft and tender. 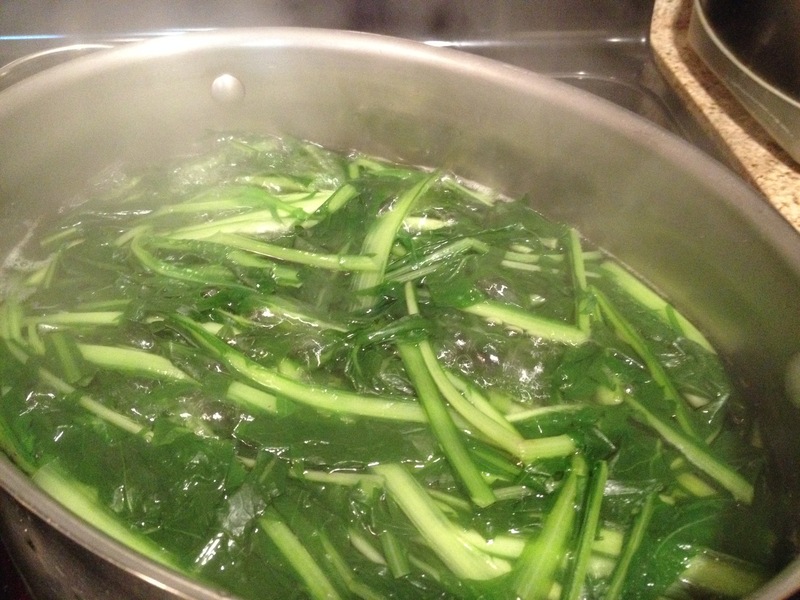 Transfer cooked greens from your pot, reserving the boiling liquid for dandelion tea. Dress with good quality Greek olive oil and fresh squeezed lemon juice. Serve with a piece of crusty bread and enjoy! Also, great to take for lunch the next day if there are any leftovers as they’re very tasty at room temperature too! A nostalgia trip for me! Thank you! We love horta and it does bring back many great memories of my yia yia! We posted one of your top recipes to our site. We signed up for your email subscription. 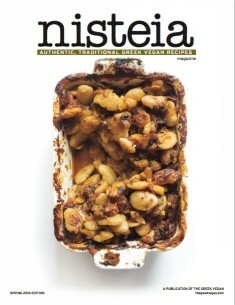 We used to enjoy Greek food when visiting the Boston area so we know we will enjoy your subscription. Thank you for sharing. Also can be stir fried in EVO. Oh yes! and add a bit of chopped garlic to the pan too 🙂 thanks for the reminder! I spent the afternoon digging up the dandelions in my yard and I made this delicious salad just like my mom used to make back in Greece many years ago. Nice – I’m doing this tonight with greens picked from the garden – including dandelions that I now consider to be part of my ongoing crops thanks to this post! Very Nice, looking for a Clean Monday dish, and this is perfect! Efharisto! Just picked up some greens, a great olive oil, lemoni, and adding a bonus of some pine nuts. I am making this now with dandelion greens, collard greens, Tuscan kale and rainbow chard. I added some oregano…and garlic along with the lemon and olive oil. I made it before with just one bunch of dandelion greens and it cooked down so much all I had was a taste. Thanks for your post Kiki, and thanks to all for the comments. I’m looking for some advice about picking dandelion greens. I made this tonight with fresh picked leaves from my yard. It was incredibly bitter, almost unpalatable, and I’m wondering if I just picked the wrong leaves. I picked a mixture of red veined and white viened leaves, trying to get smallish sized leaves, but also ended up picking some larger ones too. Anyone else have a problem with extreme bitterness and/or figure out ways to mitigate that? We want to personally you for placing your heart into helping with wild edibles. So many are conditioned missing out completely. We have a free e-book in .pdf format pinned to the top to keep, print and share if you like. Thank you for the great post ! I saw that you, also, have written about “mustard greens”. Do you know, please, which is their exact name in greek?